Just last week, local radio station 101 The Rose set their playlist to Christmas with an ever-present run of Christmas music from now through the holiday. Because our Christmas Show kicked off at the beginning of November, and we’ve been in the Holiday spirit since December 26, 2013, we really enjoy tuning into WROZ to hear some of the new Christmas tunes, beloved classics, and to hear new artists rehash the hits of Christmas’ past. And it’s on that note of holiday tunes, that I thought I’d share some of our favorite newish seasonal hits. Frank Loesser wrote “Baby, It’s Cold Outside” in 1944. It was originally recorded for the film, Neptune’s Daughter. Since its original release, several artists and actors have put their own spin on it. Funnyman Seth McFarlane (Family Guy, American Dad) and acclaimed singer/songwriter Sara Bareilles bring back the holiday classic “Baby, It’s Cold Outside.” Who knew the voice of Peter Griffin was such a crooner? This Christmas rock song was originally sung by Darlene Love. Rolling Stone magazine ranked this song and Love’s version first on their list of The Greatest Rock and Roll Christmas Songs in 2010. Several versions of the song have been done by various artists since. We loved it when Las Vegas’ own vocal quartet, Human Nature, stopped by our theatre last summer for a packed show, and we’re loving their take on this Christmas classic. You can’t go wrong with these newish Christmas songs. 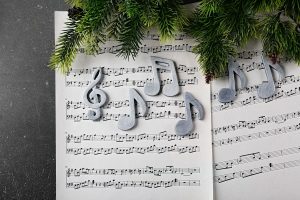 If you need more music for your Christmas playlists, check out these “must-have” holiday songs.